According to the 2017 NACUBO Tuition Discounting Study, tuition discount rates have reached a record high, challenging campus leaders to weigh student and family concerns of affordability against institutions’ financial longevity. Two principal challenges facing four-year private, nonprofit colleges and universities today appear essentially antithetical, placing institutions in a precarious situation. On the one hand, institutions face a charge from students and their families, as well as policymakers, to keep higher education affordable. On the other hand, these institutions find themselves in financially arduous times, with some facing concerns about tepid market conditions, waning enrollment, and the difficulties of fundraising, and witnessing a small number of peer institutions making decisions to close or merge with other institutions. The practice of tuition discounting is at the crossroads of these issues. 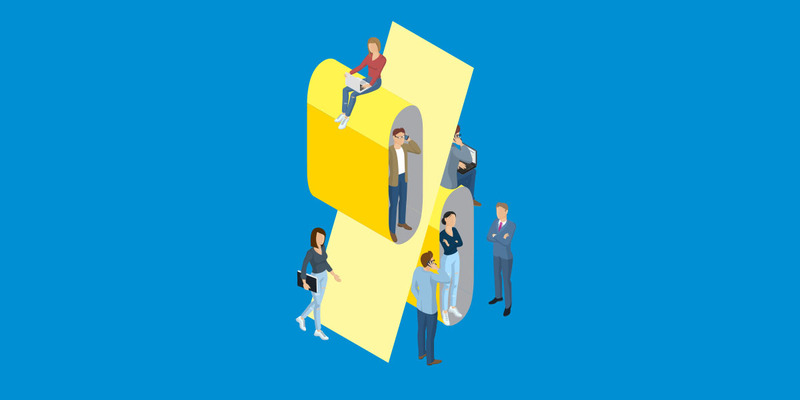 Findings from the 2017 NACUBO Tuition Discounting Study (TDS) shine a spotlight on the efforts of college and university business officers to meet these seemingly competing objectives. As the study highlights, campus leaders face myriad challenges related to these fundamental goals as tuition discount rates, on average, continue to rise for four-year independent colleges and universities. With tuition discounting, colleges and universities provide institutional grant aid to students to offset, or “discount,” the published tuition and fee price. Various discounting strategies are used to attract or retain students who are unable or unwilling to pay the full tuition and fee “sticker price.” Although tuition discounting is used at both public and private colleges and universities, the TDS has historically focused on four-year private, nonprofit institutions, because they typically award larger amounts of institutional aid. Institutional tuition discount rates—the proportion of tuition and fee revenue used to support undergraduate institutional grant expenditures—at independent institutions have steadily risen over the last decade. 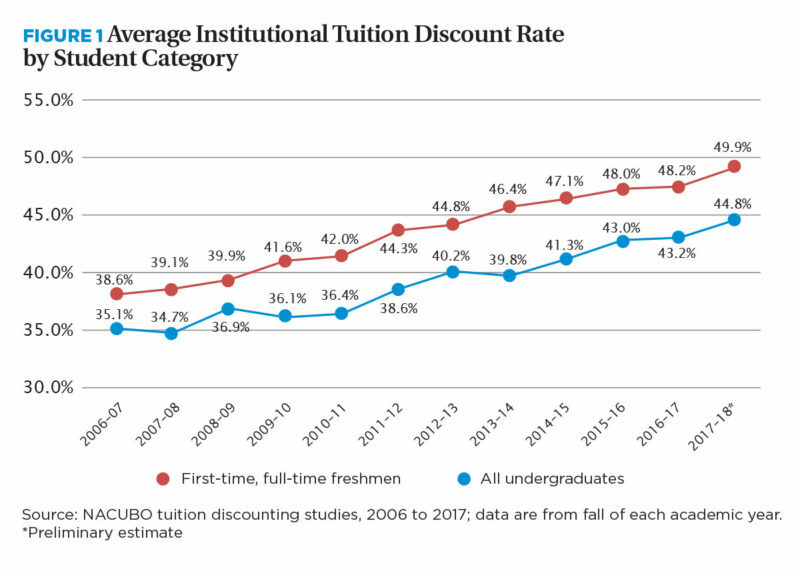 As Figure 1 shows, from 2006–07 to 2016–17, the average institutional tuition discount rate for first-time, full-time freshmen increased from 38.6 percent to a record high of 48.2 percent, and is estimated to reach 49.9 percent in 2017–18. Among all undergraduates, the average institutional discount rate is estimated to be 44.8 percent in 2017–18. 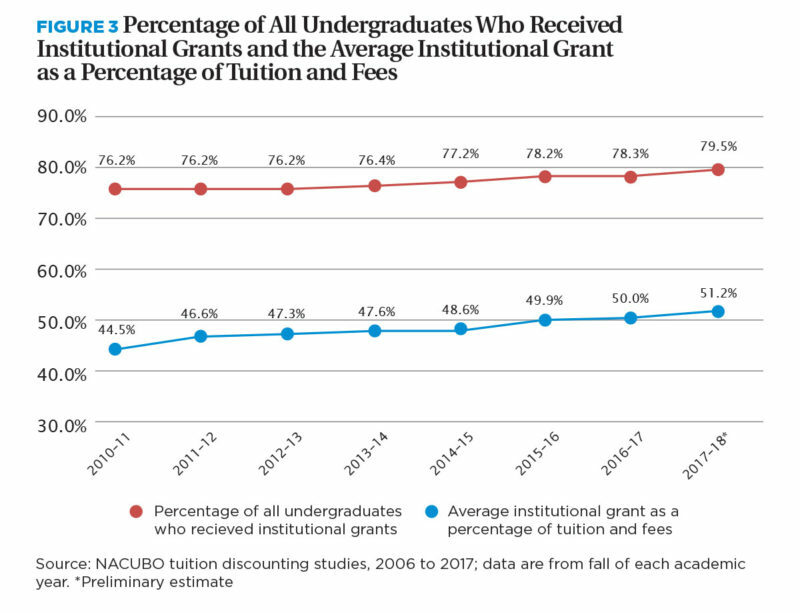 This means that on average for every dollar they collected from all undergraduates in tuition and fees, private nonprofit colleges awarded $0.45 to institutional grant aid recipients. There is variation in institutional tuition discount rates by institution type. Small institutions’ freshmen tuition discount rates reached a record average of 49.9 percent in 2016–17 and are estimated to climb to nearly 52 percent in 2017–18 (see Table 1). In contrast, institutional freshmen discount rates at research universities and comprehensive/doctoral institutions, on average, are estimated to be 44.1 percent and 44.4 percent in 2017–18, respectively. These differences highlight the importance of understanding institutional contexts when looking to the tough balancing act campus leaders must accomplish when focusing on priorities for their students and their campuses alike. Tuition discount rates at independent colleges and universities continue to rise because institutions are providing grant aid to more students, and the grant awards students receive cover a larger share of the published tuition and fee price. The TDS includes two ways to measure the impact of tuition discounting on student recipients. First, the study considers the average percentage of undergraduates who are awarded institutional grants and scholarships; second, the TDS calculates the “student discount rate,” or the average grant amount as a share of the average tuition and fees sticker price. Over the past decade, a higher share of first-time, full-time freshmen attending independent colleges and universities have received institutional grant aid, and this aid has covered a larger share of their tuition and fees (see Figure 2). 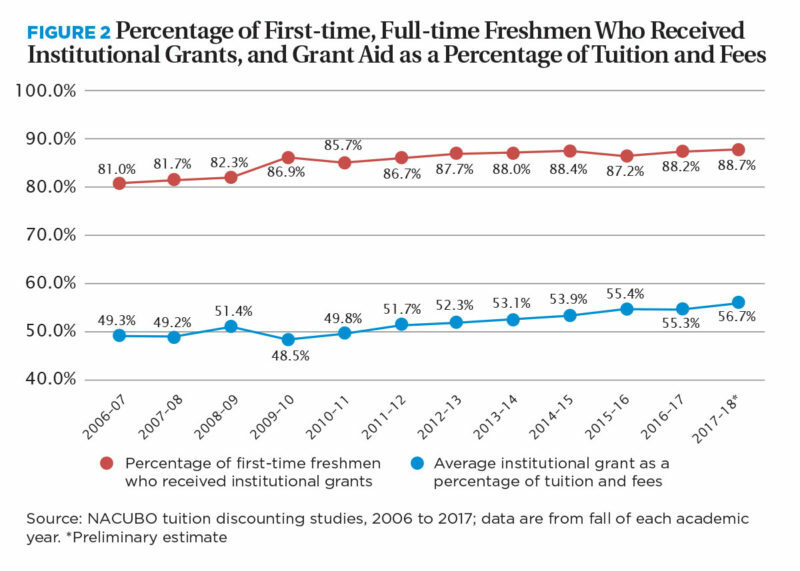 In 2017–18, nearly 89 percent of first-time, full-time freshmen were awarded institutional aid, compared with 81 percent in 2006–07. And on average, the share of the average published tuition and fee price covered by the average award rose from about 49 percent to nearly 57 percent. Carleton College, Northfield, Minn., provided approximately $41.8 million in institutional grants and scholarships to undergraduates in 2017–18, and has also seen recent increases in institutional financial aid expenditures. “Our grant aid has increased by an average of 5.7 percent annually over the past five years,” says Fred Rogers, vice president and treasurer. In addition to measuring discount rates for first-time, full-time freshmen, the TDS considers measures for all undergraduates, which include upperclassmen as well as part-time, transfer, and specially enrolled undergraduates. These data indicate that trends for all undergraduates are similar to those for first-time, full-time freshmen. 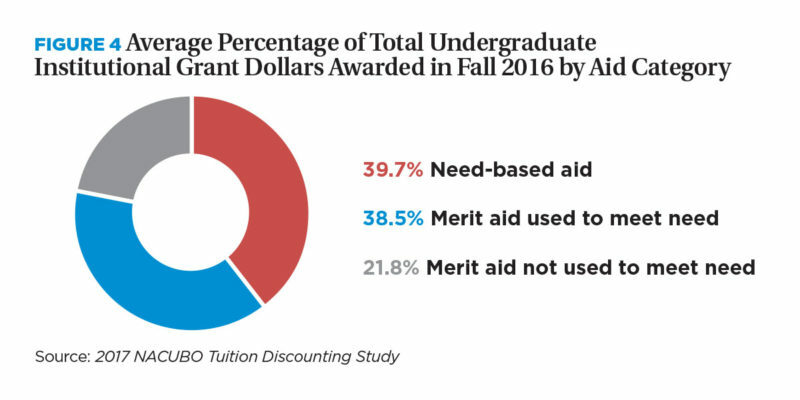 As Figure 3 shows, in 2017–18, the TDS estimates that nearly 80 percent of all undergraduates were awarded institutional aid and that, on average, this aid covered more than 51 percent of the listed tuition and fee price. With more students being awarded institutional aid that covers more than half of the listed tuition and fee price, the priority that institutions place on access to higher education, as well as the role of tuition discounting in enrollment management practices, are evident. Although many acknowledge that financial aid plays a role in providing access to a postsecondary education, some critics express concerns that the goals of student access and retention are being thwarted by institutions’ focus on prestige, as seen by the portions of aid awarded based on students’ academic merit and other “non-need” criteria, rather than exclusively demonstrated financial need. Data from the most recent TDS illustrate Dawley’s point. The TDS collects data on the proportion of institutional scholarships and grants awarded based on need- and merit-based criteria. In 2016–17, about 39.7 percent of institutional aid was awarded based exclusively on students’ demonstrated financial need (see Figure 4). Approximately 38.5 percent was awarded on the basis of merit or other “non-need” criteria, but was received by students who had some level of financial need. This means that, on average, 78.2 percent of total institutional grant aid awarded at private nonprofit colleges and universities in 2016–17 was used to meet students’ financial need (which includes need-based aid combined with merit aid used to meet need). Although increasing tuition discount rates can benefit students and help colleges and universities in realizing their access and affordability goals, discounting tuition and fees for students may have implications for institutions’ net tuition revenue. According to data from the National Center for Education Statistics, four-year private, nonprofit colleges and universities rely on student tuition and fees for about a third of their total revenues. Thus, changes in per-student net tuition and fee revenue—calculated as per-student gross tuition and fee dollars minus institutional grant aid—is an important measure for understanding the effects of discounting on college and university finances. 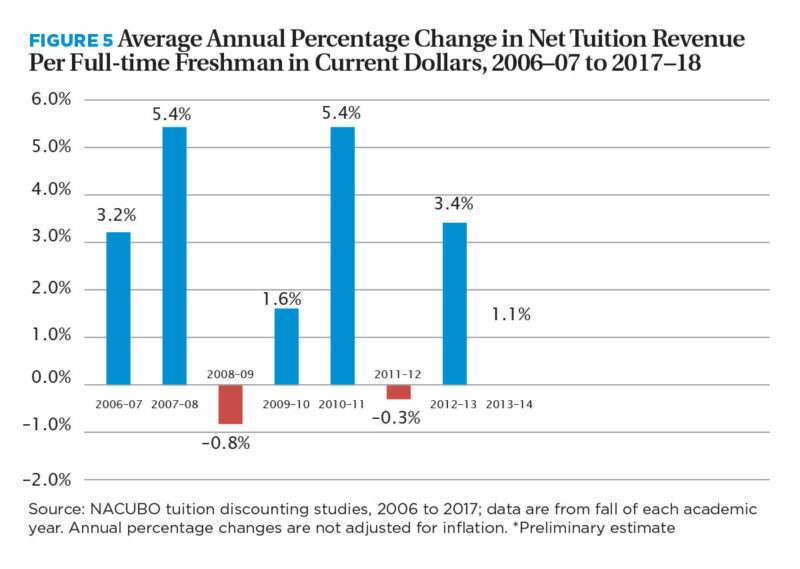 From 2006–07 to 2012–13, annual changes in net tuition revenue per first-time, full-time freshmen were quite volatile—ranging from 5.4 percent in 2007–08 to –0.3 percent in 2011–12 (see Figure 5). However, Table 2 illustrates that, in more recent years, the annual changes in net tuition revenue per freshman have been relatively low, and, when adjusted for inflation, have been essentially flat or negative. These trends beg the question: What strategies will colleges and universities use going forward, as they balance the expectations and needs of students with the realities of waning net tuition revenue growth? LINDSAY K. WAYT is assistant director, research and policy analysis, NACUBO. Participants. Institutions that participated in the 2017 TDS survey already received complimentary online access to the report. To access the report, first go to www.nacubo.org and log in to your “My NACUBO” account. Then find and click on the “NACUBO Research Study” link. Find the 2017 NACUBO Tuition Discounting Study. Nonparticipants. Institutions that did not participate can purchase online access to the report by clicking on “Tuition Discounting Study” under the “Research” tab on the NACUBO website at www.nacubo.org, and then following the “for purchase” instructions. The 2017 tuition discounting report is priced at $200 for NACUBO members and $750 for nonmembers.